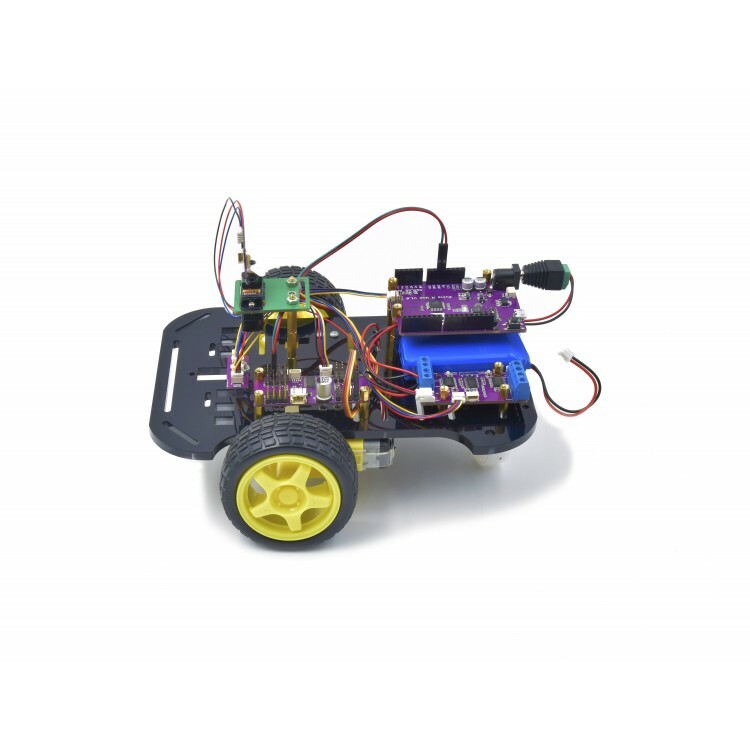 This Robot Kit contains everything you need to set up a 2 wheeled robot! 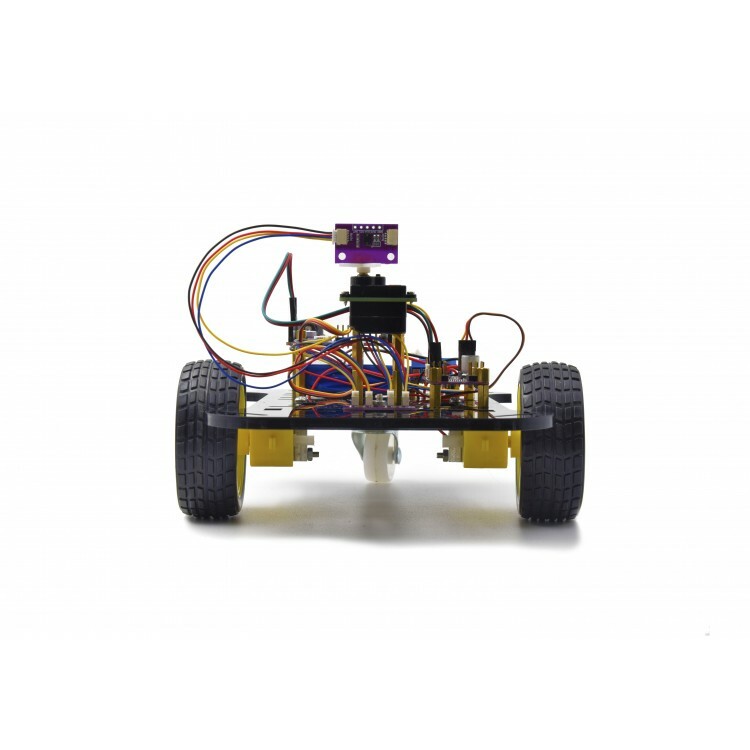 The electronic components included in this kit all feature Qwiic connectors so you can almost instantly hook up your robot, run the code, and watch it come alive! Pesky obstacles will be avoided with ease with this semi-smart robot. The electronics and code provided with this kit allow your robot to seamlessly - ok, movement can be jerky depending on the speed - navigate around objects and avoid situations where the imaginary air bags would deploy in. The chassis of this kit is sleek, black acrylic. A 3rd plastic wheel attaches on the underside of the chassis to provide balance. 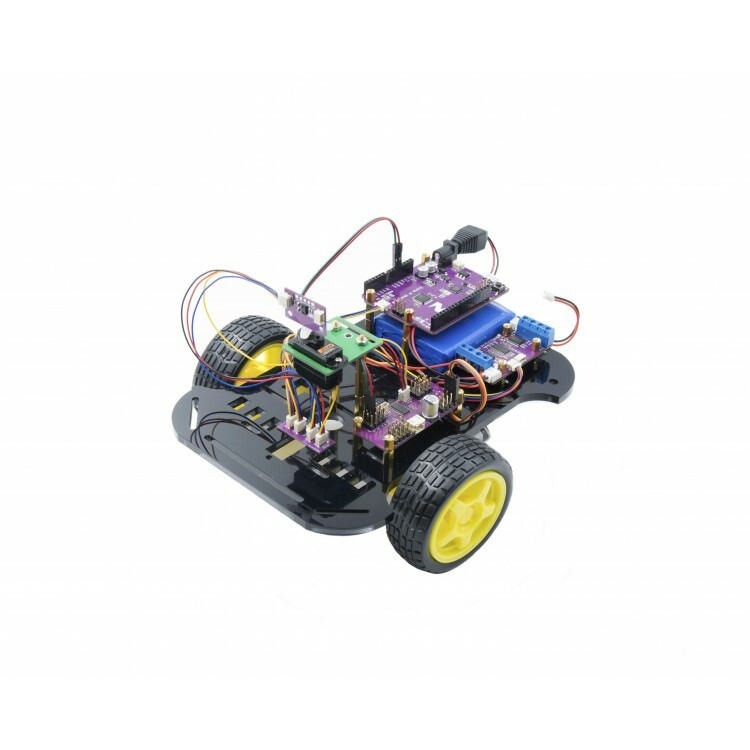 The brain of this kit is based on the ATmega328P and is our spin on the Arduino Uno R3. We’ve added Qwiic connectors onboard to enable easy daisy-chaining, plus it’s fully compatible with Arduino IDE and already familiar to many makers - including with lots of online support and tutorials that are already in existence. To drive the motor, it uses the Zio Bidirectional 4 CH DC Motor Driver. You can change the direction and the speed of the motors in addition to stopping and braking. A Zio ToF Distance Sensor RFD77402 handles distance computing and allows the robot to sense when objects are near or far. To get more accurate measurements and movements, you can add extra ToF sensors positioned either lower on the robot or on the sides and back. 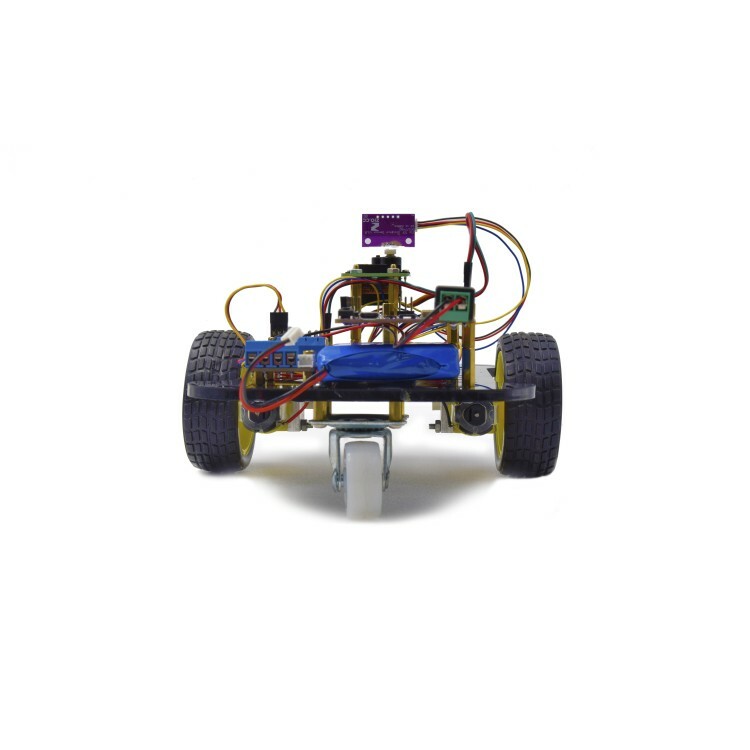 The Zio 16 Servo Controller (Qwiic) will power the servo mounted on this robot. If you’d like to add in a pan-tilt mount for the range-finder, then you can connect both servos to this board - you can actually power up to 16 servos with one board, so don’t hold back on servos! We also include a 4-port Zio Qwiic Hub in case a single chain of modules isn’t the right approach for you. And last but not least, we throw in a bonus Zio Qwiic Adapter. If you have other modules unequipped with a Qwiic connector, this will hook it up to the Qwiic network in a jiff. If you want to upgrade the functionality of this basic Robot Kit, using Qwiic-enabled modules are a cinch. Add whatever sensors, user interface devices, or actuators you’d like, there are already many in the ecosystem! Just insert the Qwiic connector and update the code. The Zio OLED Display (0.91in, 128x32, Qwiic) for when you want to display data output or messages. One of our IMUs, the Zio 9DOF IMU BNO055 or Zio 9DOF IMU LSM9DS1 (both Qwiic-enabled) for orientation solutions such as obtaining relative position - done by integrating acceleration over time - or measuring the direction the robot is going in. The PsyFi32, our ESP32 based board that adds wireless communication functions to a mini microcontroller, can be used to upgrade the microcontroller and add communication functionality to the robot.